This workshop really put to test our verbal communication skills. 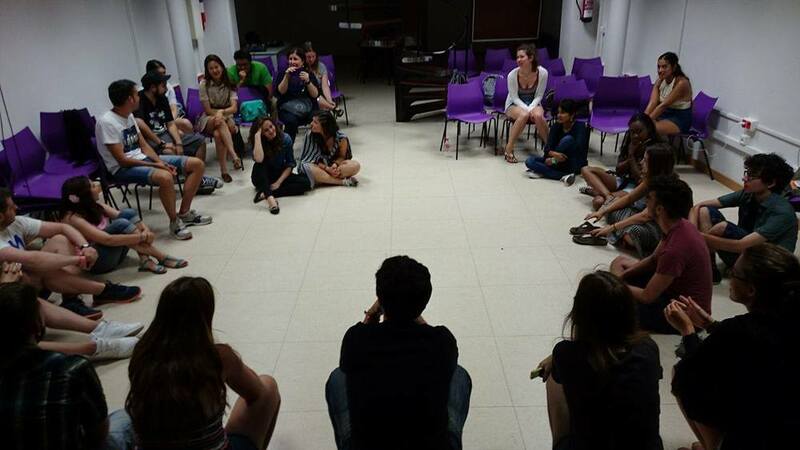 We began by sitting in a circle and introducing ourselves to our facilitator who was an acting coach. He then briefly explained the history of the Yugoslav Wars and in particular the Bosnian War. We were surprised to find out that theatre had played such an important part in the lives of ordinary people during the war. By day soldiers would be carrying out their military duties and by night they would be involved in theatre, showcasing their stories to the public. These plays had such an emotional meaning to ordinary people as it gave them hope and happiness during a brutal war. Therefore this chapter of history would be our connection to our main task of having to now act. We were told to think of a time in our lives where we felt extreme negative or positive feelings. We then had to portray our stories and feelings in one minute and share this with our fellow participants. We were placed in pairs to support one another as teamwork was essential in the successful portrayal of our stories. After perfecting out story we then had to lie on the ground and whisper our story. At first all of us were quite hesitant and exploded in laughter at the awkwardness. This took a while to subside but was still quite awkward in a funny way. Finally we all had reached the courage and that moment of "let's get this over with" and we then stood up, entered the stage each pair at a time and watched how 25 pairs of eyes descended on us. Overall, although initially this was one of the more challenging workshops, it ended with a strong sense of camaraderie. We felt liberated and thoroughly enjoyed hearing stories about AK47s, brexit, and being home alone. Start your summer with an unforgettable experience in Valencia, Spain!